And here we have it, the 2011 Layer Cake Malbec. 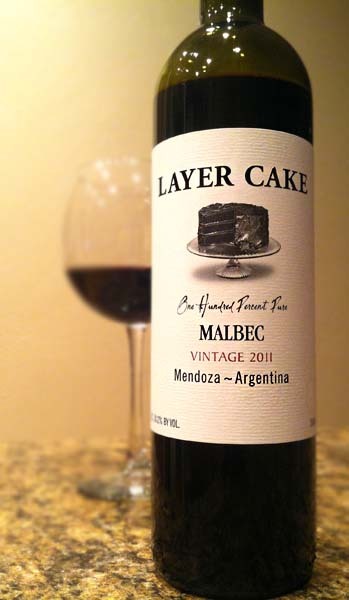 If you read through some of my amazing wine reviews, particularly the Malbec reviews, it won't take long before you see me mention the Layer Cake Malbec. The reason is that when I reviewed the 2010 Layer Cake Malbec last year, I was caught off guard. I had never tasted a Layer Cake wine and for some reason wasn't expecting the awesome contrast of dark jammy notes and the rustic earthiness that it smashed into my palate. Like I said in that review, it was easily one of the best wines I had tasted in months, especially under $20. And the more Malbec I drank after that, the more I kept comparing them to the Layer Cake Malbec. I just couldn't help it. I actually ended up purchasing several bottles of it over the past year. And for me, buying multiples of the same beverage rarely happens since I have an alcohol review website and all. It's just poor logic. Long story short, the 2010 Layer Cake Malbec was delicious. The 2011 Layer Cake Malbec pours an inky dark, dark purple. Aromas are powerful, loads of ripe blackberries, plums, vanilla, and some cocoa. Tasting brings mouth-pleasing blackberries, raspberries, blueberries, and plum jelly notes that ooze all over your mouth, followed by a barrage of dry dark chocolate, coffee, damp earth, and a slightly bitter vanilla and oak finish with good, silky tannins. The new Layer Cake Malbec maintains everything I loved about last year's vintage, if not even a bit more so. It's rustic, jammy, and a bit primal, while still being silky and somehow a touch elegant. This wine is still one of my favorites under $20 and an absolute steal at a retail of only $15. Buy it. Cook some red meat. And be a happy, happy person. Drink This: if you want one of the best, if not the best Malbec under $20. Don't Drink This: if you don't like bold, rustic-style wines. Also, click here to see all the Layer Cake wines I've reviewed.